Gridline has been in business since 2004, based in Guelph we provide services in the industrial, commercial and institutional field. Partner owners, Phil Orobono and Jeff Hayes have a combined 50 years of experience in the construction industry. 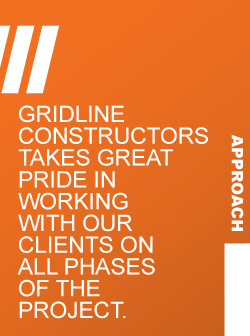 At Gridline Constructors our approach to design-build construction is clear: we strive to be a single source responsible for delivering quality workmanship at a fair market value, and to develop relationships where our clients and sub-trades are treated fairly and with respect. The turnkey style of our Project Managers provides clients with the opportunity to work with one prime contact from project conception through to final completion. From preliminary pricing and design, authority approvals, architectural and engineering services, to completion of the final product, Gridline Constructors takes great pride in working with our clients on all phases of the project. With strong communication and demonstrated integrity, we develop relationships with our clients that last well beyond the projects we build. This is evident in the repeat business and referral contracts that we encounter. We strive to produce results that leave our clients feeling confident with every aspect of the project . Our trade contractors share our commitment to fairness, honesty, quality and service. Collectively we work towards our clients’ total satisfaction. At Gridline safety is more than policies and procedures – it is an attitude we have a responsibility to provide a safe and healthy environment for our employees, our families, and the communities which we serve and are a part of.